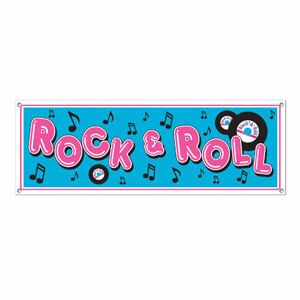 Liven up your rock n roll party with our Rock & Roll Sign Banner! This 5 foot by 21 inch banner is weather proof and contains 4 grommets for easy hanging. Each package contains 1 sign. 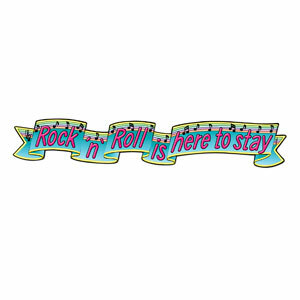 Let everyone know rock & roll is here to stay with our 6 foot Rock & Roll banner! This giant banner is perfect for any 50's rock & roll themed party. Each package contains 1 banner. 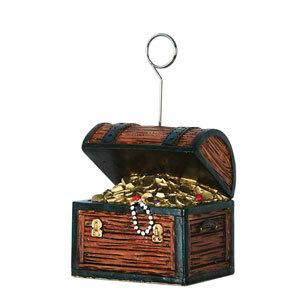 Anchor your helium-filled booty with our Treasure Chest Balloon Weights! Each weight is 6oz, and resembles a treasure chest bursting with treasure. Packages contain 1 unit. Show your national pride with our Stars and Stripes Table Runner!� This 12 inch by 6 foot fabric table runner is perfect for your patriotic or election themed party. Contains 1 per package. 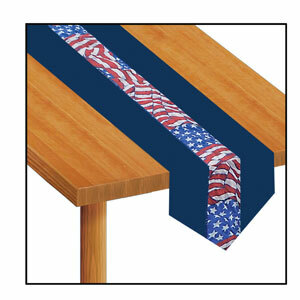 Four score and seven years ago, they probably didn't use this Satin American Flag Table Runner - but you can, and should! This 9 1/4 inch by 25 foot all-satin table runner can be safely cut to length to fit your party table. Contains 1 per package. 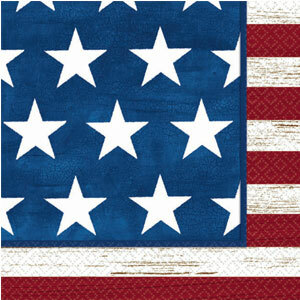 Our Americana themed paper goods are great for all patriotic celebrations and 4th of July parties. 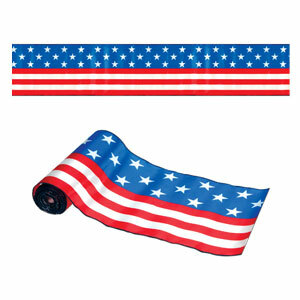 This design features a true blue background with white stars in the center with a white and red striped border. Sold 1 tablecover per pack. 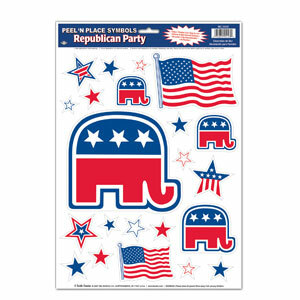 Show your pride for the Grand Old Party with our Republican Peel n Place! Contains 22 stickers per 12 inch by 17 inch sheet featuring various republican and patriotic themes. Contains 1 per package. Show your democratic pride with our Democratic Peel n Place! 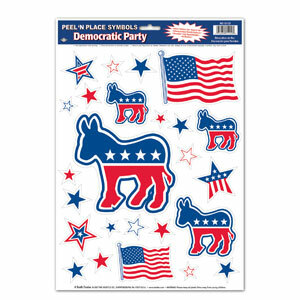 Contains 25 stickers per 12 inch by 17 inch sheet featuring various democratic and patriotic images. Contains 1 sheet per package. 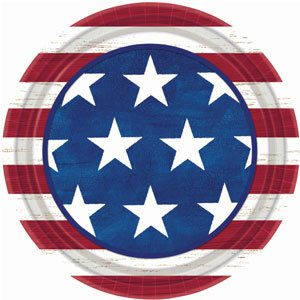 Our Americana themed paper goods are great for all patriotic celebrations and 4th of July parties. This design features a true blue background with white stars in the center and a white and red striped border. Sold 50 plates per pack. 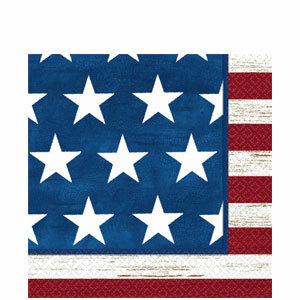 Our Americana themed paper goods are great for all patriotic celebrations and 4th of July parties. This luncheon napkin design features a true blue background with white stars in the center with a white and red striped border. Sold 100 napkins per pack. 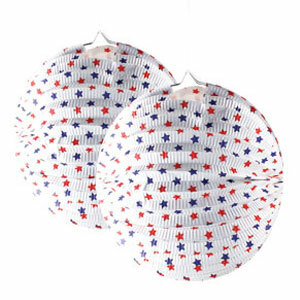 Show your American pride with these 9 inch round American stars lanterns. They are perfect for occasions such as Memorial Day, 4th of July, and Labor Day. The lanterns come 3 per box.